Prehistoric CSI: Secodontosaurus: The "Fox-Faced Finback"
When first discovered in the 1880s, Secodontosaurus was a petrified enigma. The slender muzzle meant its bite would have been a quick snap – perfect for small, hard-to-get prey. But the body was huge, almost 250 pounds, and the low, massive forequarters could perform heavy work. This new species could also easily be confused with the Dimetrodon - both have four stubby limbs and tall fins on their backs. 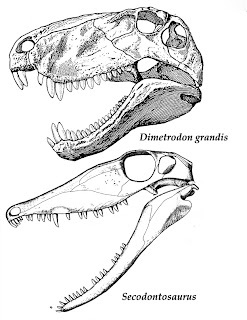 However, it had an unusually narrow skull - hence the nickname "Fox-Faced Finback" - which was probably used for some kind of adapted feeding strategy, like burrowing. And, instead of the Dimetrodon's enlarged killing fangs, Secodontosaurus had a long row of small teeth, each sharp-edged like a little knife blade. 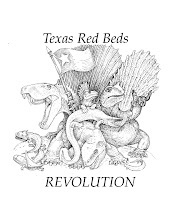 This species is also much more rare than Dimetrodon, fossils of which are all over the Texas Red Beds. 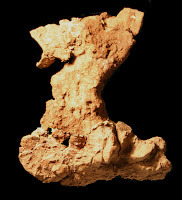 The last fossil of Secodontosaurus found there was unearthed in 1936. That is, until dig team member and teacher Nancy Lauletta Bowen discovered a piece of one in 2006. This is the first Secodontosaurus fossil found in 70 years, and it's the first excavated with modern, CSI methods - which means that much more diverse information has been preserved about this fossil than any other of its kind. 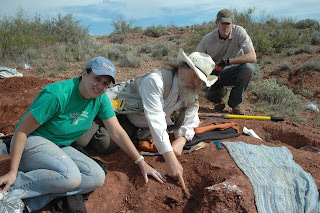 Lauletta Bowen and Dr. Bakker point to her Secodontosaurus find. Detailed image below. What an excellent fossil finder this Lauletta-Bowen seems to be! And she is quite the looker too. The guy is totally just, and there is no skepticism. Quite worthwhile material, thanks for your post.